America | The Veterans News Channel are always a viral fan favorite this time of year, but, usually, it’s only Christmas themed. FreedomAutosport is going viral for their very American themed Christmas light show in honor of US veterans and service-people. CLICK HERE for the special US Soldier Edition of ‘Twas The Night Before Christmas!! Marine Lance Cpl. Travis Williams and the eleven soldiers in his team were on a rescue mission in Barwanah, Iraq in the summer of 2005 when tragedy struck. By complete chance, Lance was told to move to another vehicle before taking off. Only a short time later, a powerful explosion shook the ground. The truck holding his entire team was completely destroyed. Now, he must deal with being the only survivor of his crew everyday. 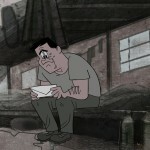 Story Corps honored Lance and his team this Veterans Day in this emotional short animated film. Christmas light shows are always a viral fan favorite this time of year, but, usually, it’s only Christmas themed. FreedomAutosport is going viral for their very American themed Christmas light show in honor of US veterans and service-people.